When l was researching the Instant Pot, l was excited that I could make an entire roast chicken in the pot. 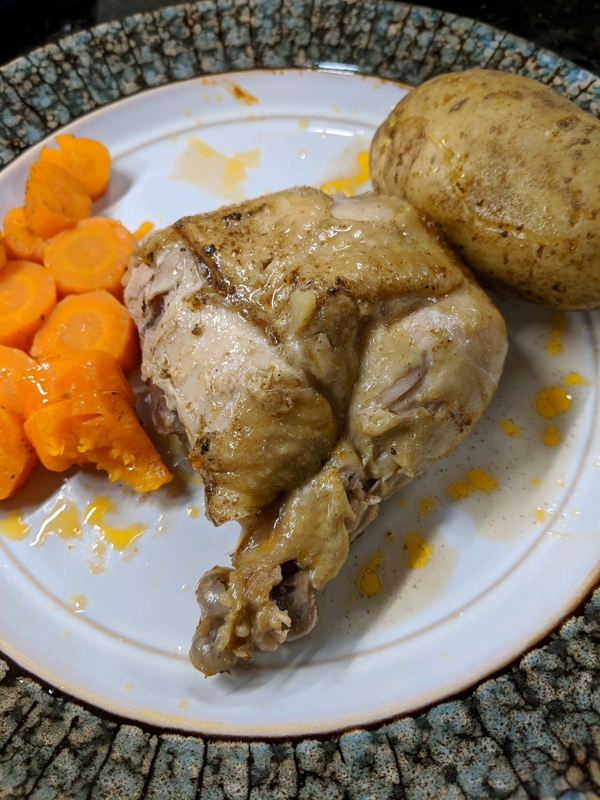 I found a recipe that looked promising (https://www.apinchofhealthy.com/instant-pot-whole-rotisserie-chicken/). The Instant Pot recipe app included a recipe for roast beef with potatoes and carrots. The trick was to do a quick release (vent the steam to release the pressure), and the potatoes and carrots, and then cook for another 10 minutes. I like the idea of cooking the entire meal in the same pot. I made two mistakes, but the meal still turned out delicious. When calculating the time that the chicken should cook at high pressure before the quick release, l took the time in the recipe and subtracted 10 minutes. However, the time to cook a chicken depends on weight. As my chicken was lighter than the one in the recipe, I should have looked at the chart in the Instant Pot recipe booklet to see that roasting chicken is 8 minutes per pound. After I added the potatoes and carrots, the pot took time to come back up to pressure. Some cooking occurs during that time. I should have also looked at a recipe for roast beef without potatoes and carrots, to determine how to adjust cooking time. When the additional ten minutes was up, I did a 10 minute natural release (pressure naturally diminished due to reduced steam), and opened the pot. To make sure the chicken was cooked, I measured with a meat thermometer. The temperature was 190f, but a chicken is cooked at 165! Fortunately, overcooking chicken in a pressure cooker is forgiving. In an oven, the bird would dry out. In the pressure cooker, the steam kept the bird moist, and the mest became exceptionally tender. So, while I took far longer to cook this meal than I needed, it turned out delicious.